Selective knock-down of Per1 and Per2 mRNA within the vmPFC of rats in experiment 1. A, Coronal brain atlas diagram (Paxinos and Watson, 1986) showing approximate location of AAV-Per1/Per2 shRNA+eGfp-infected cells (eGfp mRNA expression) for each individual rat in experiment 1 (key shows rat ID# and associated color outline). B, Representative photomicrographs of relative Per2 mRNA (red channel) immunofluorescence in virus-infected cells (eGfp mRNA, green channel) and nearby uninfected cells of a rat receiving the knock-down virus (KD) or control virus (SCR). Note the limited Per2 mRNA expression in eGfp mRNA-positive cells (white outline) of KD but not SCR condition. Scale bar = 50 µm. C, Representative photomicrograph of relative Per1 mRNA (red channel) immunofluorescence in virus-infected cells (eGfp mRNA, green channel) and nearby uninfected cells (e.g., white arrows) of rat receiving the KD virus. Note the reduced immunofluorescence of Per1 mRNA within the zone of infected cells. Scale bar = 50 µm. D, Average percentage reduction of Per1 and Per2 mRNA immunofluorescence in eGfp mRNA-positive cells compared to nearby uninfected cells (n = 12 rats). E, F, SCN clock gene expression (Per1 and Bmal1 mRNA) of rats with vmPFC Per1/Per2 knock-down in experiment 1. Note, Bmal1 and Per1 mRNA represent positive and negative arm components of the molecular clock, respectively, and have expected antiphasic expression patterns (Chun et al., 2015) in rats regardless of AAV treatment condition. D–F depict mean ± SEM. 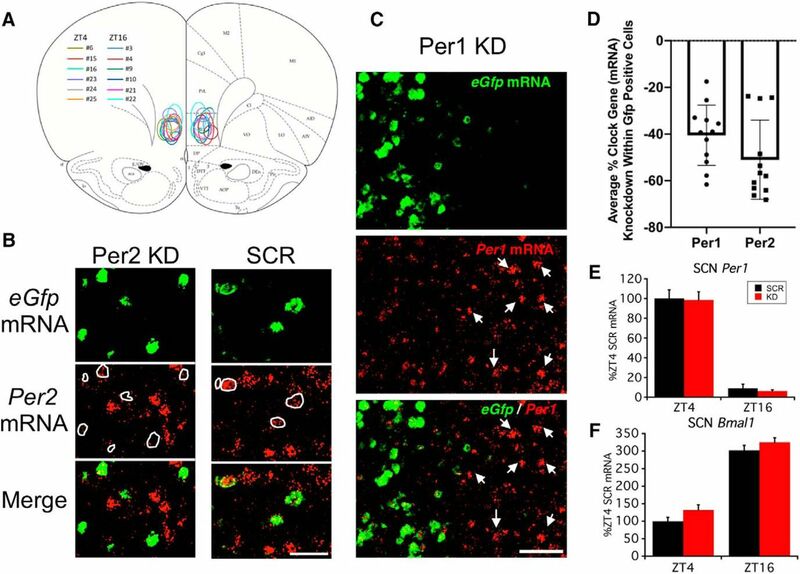 Knock-down of Per1/Per2 mRNA in vmPFC prevents time-of-day-dependent (ZT16) superior conditioned fear extinction recall. 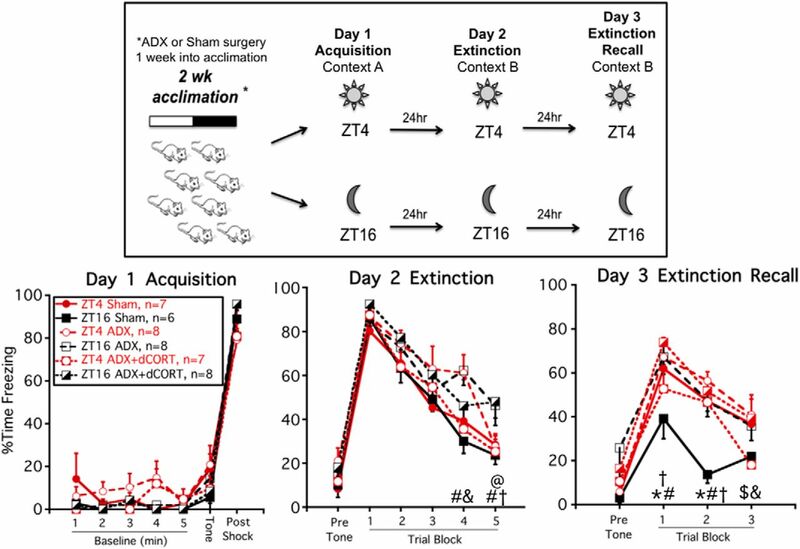 Experimental timeline (upper panel): rats received bilateral microinfusion of AAV-Per1/Per2 shRNA+eGfp (KD) or control virus (SCR) in vmPFC and one week later were trained and tested in a 3-d auditory conditioned fear/extinction regimen at either ZT4 or ZT16. Freezing behavior (lower panel, mean ± SEM): there was no overall effect of time of day on day 1 acquisition, or 24-h conditioned fear recall (day 2, trial block 1), and no time of day by virus condition interaction for within session extinction (day 2, trial blocks 2–5). But rats given control virus had superior extinction recall at ZT16 compared to ZT4 (day 3, trial block 1). Knock-down of Per1/Per2 mRNA within the vmPFC prevented this superior extinction recall; *p < 0.05, ZT4 SCR versus ZT16 SCR (FLSD); #p < 0.05, ZT4 SCR versus ZT4 KD (FLSD), &p < 0.05, ZT16 SCR versus ZT16 KD (FLSD); †p < 0.05, ZT4 KD versus ZT16 KD (FLSD). ADX ± diurnal CORT replacement prevents time-of-day-dependent conditioned fear extinction recall. Experimental timeline (upper panel): rats were given sham or ADX surgery one week before conditioned fear/extinction training. Some ADX rats were also given CORT in their drinking water to restore a diurnal pattern of circulating CORT (ADX+dCORT). Rats were trained and tested at either ZT4 or ZT16. Freezing behavior (lower panel, mean ± SEM): there was no overall effect of time of day or adrenal status on day 1 acquisition, 24-h conditioned fear recall (day 2, trial block 1) or within session extinction (day 2, trial blocks 2–5). But sham rats trained and tested at ZT16 had superior extinction recall compared to each of the other groups (day 3, trial blocks 1 and 2); *p < 0.05, ZT4 sham versus ZT16 sham (FLSD); #p < 0.05, ZT16 sham versus ZT16 ADX (FLSD); &p < 0.05, ZT4 ADX versus ZT4 ADX+dCORT (FLSD); @p < 0.05, ZT4 ADX+dCORT versus ZT16 ADX+dCORT (FLSD); †p < 0.05, ZT16 sham versus ZT16 ADX+dCORT (FLSD); $p < 0.05, ZT4 sham versus ZT4 ADX+dCORT. A combination of diurnal CORT and post extinction training acute CORT restores superior conditioned fear extinction recall in ADX rats. Experimental timeline (upper panel): rats were given sham or ADX surgery one week before conditioned fear/extinction training. 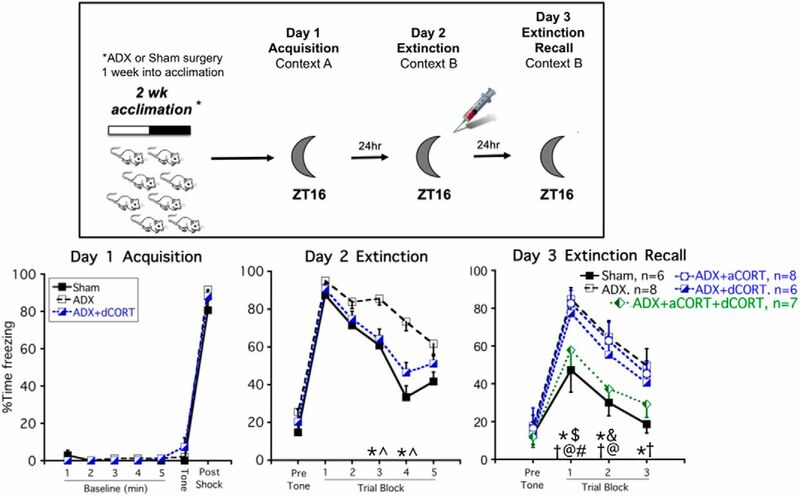 Some ADX rats were also given CORT in their drinking water (ADX+dCORT), an acute injection of CORT immediately after day 2 extinction training (ADX+aCORT) or both (ADX+aCORT+dCORT). All rats were trained and tested at ZT16. Freezing behavior (lower panel, mean ± SEM): there was no overall effect of adrenal status on day 1 acquisition, 24-h conditioned fear recall (day 2, trial block 1) or within session extinction (day 2, trial blocks 2–5). But sham and ADX+aCORT+dCORT rats had superior extinction recall compared to each of the other groups (day 3, trial blocks 1 and 2). Data for ADX rats that had not yet received an acute injection of CORT or saline after day 2, were pooled on days 1 and 2 for clarity of presentation; *p < 0.05, sham versus ADX (FLSD); ^p < 0.05, ADX versus ADX+dCORT (FLSD); #p < 0.05, sham versus ADX+dCORT (FLSD); †p < 0.05, sham versus ADX+aCORT (FLSD); @p < 0.05, ADX+aCORT+dCORT versus ADX (FLSD); $p < 0.05, ADX+aCORT+dCORT versus ADX+dCORT (FLSD); &p < 0.05, ADX+aCORT+dCORT versus ADX+aCORT (FLSD).